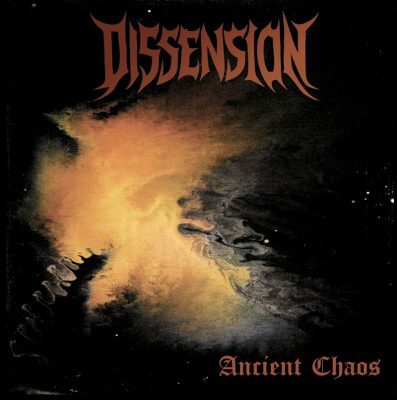 There’s quite a lot to respect and enjoy with Salt Lake City’s Dissension, who take a hefty influence from early-’90s death metal. One of its most enduring qualities is that—at least, in my opinion— it’s better than most of Deicide’s catalogue, more than half of Morbid Angel’s catalogue, as well as that of Malevolent Creation. Ancient Chaos sounds like it could have come straight from that golden era of death metal, just without the Scott Burns production sound, which is definitely nice. The production is beyond fantastic—each instrument is clear yet raw. It’s outstanding in all ways, but a standout is the sound of the drumming from the masterful Alejandro Gomez, who is no stranger to extreme metal. The drum sound and clarity is one of the album’s biggest strengths. A lot of drummers today in extreme metal rely on drum triggers or just an overproduced sound that lacks that organic feel that is so necessary in creating metal. If an album’s produced tones don’t match the band’s live performances, it almost feels like what you hear on record is a giant cheat.